← Chelsea Deserves Our Support. 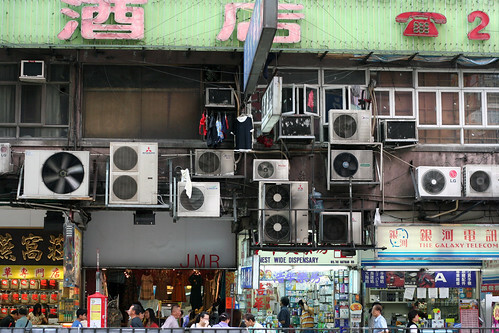 Air conditioning units on a building – hanging frighteningly above the public. Photo credit: niallkennedy. If your place is swelteringly hot, check these suggestions out. Although I’ve made iced coffee at home I’ve yet to make coffee-cicles. It’s only August. If you live in a place like I do, where the temperatures get absolutely insane for no good reason (IMO), these might be helpful. For some, it’s dry, for others – the humidity can destroy ya’. Not every idea will work for every home or climate, but perhaps you’ll be as surprised as I was about some of them. Cold-water bottles in your bed. Use your curtains like a candle wick. I love this one. Many Apartment Therapy readers (it’s a great site – you should definitely check it out) discuss the very wise method of keeping out sunlight during the day and regulating the temperatures via circulating the air in and out of the apartment (hot air out, cool air in – if the temperature is cooler outside than inside) via fans in and outside of windows. Let science guide your choices. Sleep lower to the floor. And if you have a winder that is higher than another (or you can lower the top half of your window rather than raise up the bottom half), pull cooler air in via the lower window and push the hot air out with the higher window. The idea is that if it doesn’t ever get terribly hot in there and you are regulating it properly one can keep his or her home much more comfy throughout the hot summer days and nights. If you are placing a fan or air conditioning unit in a window, please be certain that it will not fall out on to any living creatures or a sidewalk below. And if you are walking, just as we avoid falling ice in Chicago, you might want to avoid that annoying “air conditioner pee” that can make the freshly showered feel just a little icky. Ok, a lot icky. Beds Beds Everywhere But Not a One for Sleep. … as I was saying, there’s a frustration for certain in being incapable of getting proper rest at night because your living space is uncomfortable. The Brits have some thoughts on the matter as well. Soak a tee shirt in cold water, wring out the excess until just damp and wear in bed. Also, put a damp cloth across any fans you might be using to create a poor man’s air con effect! Read the other ideas here and here.